Shopaholics beware: your addiction just got an official enabler. MasterCard is introducing MasterPass, a new service that will make it even easier to shop and make purchases from virtually any mobile device, whether it's a smartphone in the dressing room or a tablet at the coffee shop. The service builds on MasterCard's current PayPass Wallet services, which allow consumers to do things like make purchases by tapping their credit cards at NFC terminals, or use a dedicated checkout button for online purchases. With MasterPass, there's new functionality like the ability to scan a product barcode while in the store aisle and make the purchase right then and there, within the store's app. "We think merchants want to create their own unique shopping experiences, their own apps . . . and the idea here is, we want to offer services that make it easy for those merchants to plug in payments into those apps they create," said Ed Olebe, SVP & Group Head at MasterCard Worldwide. 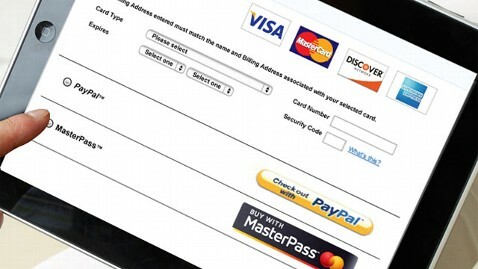 An example of MasterPass' technology would work similar to Amazon.com's 1-Click ordering button, which lets customers make purchases almost instantaneously on the retail website, since their credit card information is already stored and charged automatically, and purchases are shipped to a default address. With MasterPass, participating merchants can now embed the same functionality into their customized store apps, enabling customers to check out even quicker, via their smartphones and tablets. "From whatever device, whether it's your phone, your tablet, whatever - why can't you buy . . . in a location that makes the most sense to you? MasterPass really is this technology . . . that enables these different types of shopping experiences," said Olebe. As the shopping landscape and consumer purchasing channels evolve, it appears MasterCard is keen on keeping up. In addition to barcode scans, MasterPass will support the use of QR codes, tags and mobile devices used at checkout. Merchants can take their digital offerings even further by offering MasterPass-enabled digital wallets. The wallet will be open, and allow consumers to use other branded credit, debit and prepaid cards in addition to their MasterCards. "We want to let consumers choose their own device and we've built the platform to enable that," said Olebe. MasterPass will launch in the US this summer.